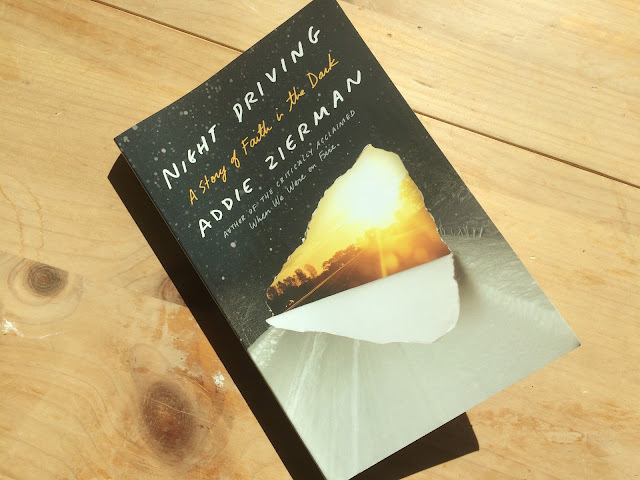 Night Driving: A Story of Faith in the Dark, by former evangelical good girl and blogger Addie Zierman, was a fast, familiar read for me in many ways. She grew up in the Northwest suburbs of Chicago, as did I. She experienced a warm and rosy falling in love with Jesus in her early teens, as did I. She is navigating a shift in her faith as she matures, as am I. She admits to escapism as her way of dealing with life's darker moments, as do I. This memoir begins with what seems a bad case of seasonal affective disorder, which drives her to pack her two little boys and numerous totes of clothing, snacks and kid gear in the family minivan for a 3,000-mile February road trip from her current home in icy Minnesota to the beaches of Florida. (This might be where the similarities break down a little, as I would never be insane enough to drive myself more insane by taking a solo trip with children!) But, having lived in or taken trips to Asia, Illinois, Kentucky, Indiana, Wisconsin, Tennessee, North and South Carolina and Florida, I was familiar with the settings of nearly all her flashbacks and pit stops along the harrowing, hazy and heartfelt journey. It's like this: Once upon a time, I learned that God came like light. I spent a long time head against the window, peering into the darkness, praying for God to come like a spotlight, like a fire, like some wild laser show in the pitch-black sky. I learned to fear the darkness, and when it came, I struck myself against everything around me, trying to make sparks (208). She doesn't just write beautiful prose in order to shroud her failings in poetic mystery. Zierman's strength is in not shying away from the details of her personal darkness. In admitting to her "problem with flirting," her near-miss affair, her alternately loving and laissez faire parenting style, her unabashed infatuation with vampy TV shows, and her propensity to drink too much diet coke and too much wine, she avoids painting herself nice in this early mid-life word portrait. If there was a support group for this kind of thing, I'd stand up and say 'I'm afraid that I don't exist if men don't notice me' (93). While I bristled a bit to her addiction to male attention in all its crude and unsavory forms-- as an introvert I skew in the opposite direction--- I can relate to the desperate feeling of irrelevance and the longing for validation, and I think most people can. Framing this fear as an addiction that needs to come to light was immensely helpful to me. And that brings me to my final thought: Readers expecting explicit, biblical prescriptions for depression, waning faith or addicitons might find the book wanting. Though the author spent her formative years poring over scripture, and does eventually muse on some familiar verses near the end of the book, readers looking for lessons will see them quietly emerge from the author's personal experience. This is fitting, as Zierman's introduction to God and faith, like many Christians, was all about what we could feel. To counteract this ingrained habit, the book's concluding scenes delight in a God who dwells in the darkness as well as the light. In short, I recommend Night Driving to Christians grappling with hard-to-name addictions, an evolving faith, or the onset of a "new normal" in their spiritual landscape. I received a copy of this book from Blogging for Books in exchange for my honest review. Jesus Asks: Do you want to be made well?